Six vehicles won the red dot award 2008. With its successful performance at the red dot award 2008, BMW Group continues its career of excellence in pioneering design. This year, a total of six members of the BMW Group won the internationally acclaimed lable. Two of them, the BMW 3 Series Convertible and the BMW G 450 X motorcycle also won awards in the special category "red dot: best of the best" for outstanding design achievements in the automotive, transport and caravan segment. The trophies will be presented on 23 June, 2008 on occasion of the awards ceremony at the Aalto Theatre in Essen/Germany. Other finalists for the red dot awards 2008 were the BMW X 5, the BMW 1 Series Coupe, the Rolls Royce Phantom Drophead Coupe and the BMW HP2 Sport motorcycle. BMW Group globally operating subsidiary BMW Group DesignworksUSA also impressed the highprofile members of the jury. The design studio won a red dot award for the interior design of the Embraer MSJ business jet and the design of the Zeydon Z60 luxury yacht. For the first time in the history of the red dot awards, the jury will provide "honourable mentions" during this year's ceremony. With these honourable mentions, the jury will pay special attention to products that have clearly set themselves apart from the competition by their particularly successful design solutions. According to the jury, three current BMW Group models deserve this special recognition: the BMW M3 Coupe, the MINI Clubman and the BMW F 800 GS motorcycle. Launched in 1955, the red dot award has become established as one of the most important design awards in the world. Thirty red dot awards are granted to contenders in the automotive, transport and caravan category, three of which are also presented with the "best of the best" award for particularly pioneering design. Two of these top three are current members of the BMW Group family: the BMW 3 Series Convertible, which reinterprets the classic line flow of an open BMW 3 Series by combining it with a retractable hardtop, and the BMW G 450 X motorcycle, a no-nonsense sports enduro that openly displays it zest for contest. The repeated great success of BMW Group with the red dot awards again confirms that outstanding design quality will be rewarded with international recognition. Last year, BMW Group was honoured for its ongoing, innovative design achievement; as a highlight of the gala, BMW Group was presented with the title "Design Team of the Year". In 2007, BMW Group and BMW Group DesignworksUSA won a total of eight red dot awards for products design. The fact that all models of all brands regularly contribute to the success of BMW Group during highly acclaimed design competitions such as the red dot award confirms the strength of BMW Group Design's unusual concept that combines a common design philosophy with brand-specific design strategies. Dr. Klaus Draeger, Head of BMW Group's Development and Purchasing division to which BMW Group Design belongs said: "When we introduced a new concept, which would unite all our different brand design studios in the culture of BMW Group Design, we clearly made the right decision. Expressing the fact that all our products belong to the family of BMW Group and ensuring the efficient cooperation with all process partners while boosting the unique personality of the individual brand can only be achieved when all team members are working closely together." Without mentioning his plans to buy auto dealerships around the country, CEO of Dell Inc. Michael Dell told the Detroit Economic Club tthat he sees "opportunity all up and down the spectrum" in the auto industry. The firm that manages Dell's personal fortune is launching a joint venture with former Charlotte, N.C.-based Sonic Automotive President Jeffrey Rachor to buy dealerships that sell premium and import brands. "When people are panicking and don't really know what to do, that's probably the period of greatest opportunity from an investor's standpoint to make changes and do good things," Dell said during a question-and-answer session. "Now you have to have receptivity to change, and you have to embrace change, but what other choice do you have?" Dell, 43, said he doesn't know if his company's computers will make it into vehicles, but that placing them there is sometimes discussed with automakers. Dell's investment deal with Rachor was announced last month. The venture, Chattanooga, Tenn-based MSD Automotive Partners L.L.C., is expected to invest in high-end luxury and import dealerships. One expert said the fund could invest as much as $500 million. Dell discussed the future of his company, American competitiveness and technology during his appearance. Technology is enabling small companies in places such as Michigan to take advantage of economic growth around the world, Dell said. "It used to be that global companies were only the biggest companies in the world," he said. "We're seeing a lot of small- and medium-sized companies, particularly machine tool companies and equipment companies. They might be based here in Michigan, but they also have an office in China, they've got one in India. Technology kind of enables this." Dell spoke of the power of "compound innovations" that come from combining advances in a range of industries. "We see our customers doing some amazing things with our products that we could never have imagined," he said. 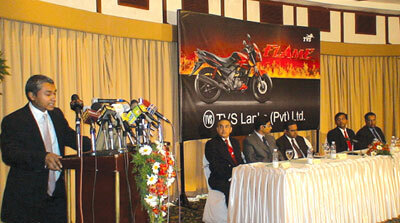 The new TVS Flame has innovative DeltaEdge styling: The Embedded DeltaEdge trafficators give the bike a sporty finish. The chic DeltaEdge exhaust is not only unique but also enhances performance and is designed to deliver the smoothest of sounds and low emissions. The bike flaunts an elegant backlit LCD digital console that prominently displays a fitness check indicator, and low fuel warning. This motorcycle also features an intelligent mileage indicator (IMI) that provides instantaneous mileage per litre data to the rider. The rear end of the bike sports a dual lens tail lamp that is best in its class. The DeltaEdge styling coupled with snazzy dual tone graphics translates into an amazing road presence with an exceptional combination of power, mileage and stunning looks. At the focal point of stunning and aerodynamic styling of TVS Flame sits a revolutionary four stroke 125 cc three-valve engine, which is propelled by unique dual induction system, coupled with a universally accepted and traditionally proven single spark plug ignition system. This combination enables the bike to deliver the best performance in its class without any compromise on fuel economy. The engine employs two separate induction ports called power port and swirl port to achieve this outstanding "no compromise" performance. The power port creates tumble motion to the air-fuel mixture in the combustion chamber delivering excellent throttle response and power for quick acceleration. The swirl port achieves extraordinary efficiency by utilising the unique flow of air-fuel mixture to burn extremely lean air-fuel mixtures in the combustion chamber, providing high efficiency in city riding conditions. TVS brought this engine technology to Sri Lanka with the CCVTi engine. This engine has been developed and patented by AVL and licensed to TVS in India. AVL, Austria is the world leader in Internal Combustion Engine technology. AVL is the world's largest privately owned independent company, which develops power train systems and internal combustion engines. AVL is a leading provider of technology to the global engine and automotive industry. AVL has developed engines for most of the major automotive companies in the world. "When it comes to styling and special features, we are particularly proud of the styling of this motorcycle. For too long, international and contemporary styling has been restricted to motorcycles that are over-priced for today's young, aggressive and professional customers". Now, Flame allows the consumers to break all compromises that they so far have been forced to make, whether on style, performance, mileage or price. 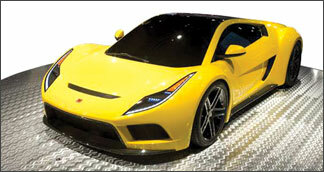 Saleen has unveiled an all-new supercar concept called the S5S Raptor. The new S5S Raptor is "primarily a street vehicle," according to Saleen, although it stresses that the Raptor's dynamic qualities "will not be compromised." Officials went on to say the Raptor "is designed to provide a truly American alternative to the European exotics." Power will come from a mid-mounted 5.0-liter supercharged V-8 putting out 650 bhp at 6300 rpm and 630 lb.-ft. of torque at 4400 rpm. The engine is designed to run on E85; what's more, unlike today's flex-fuel cars, this one is apparently dedicated to ethanol: "By using ethanol fuel, the powertrain is able to run higher compression and yield approximately 5 percent more horsepower than our normal 5.0-liter supercharged engine," the company says. A 6-speed manual transmission will come standard in the Raptor, with a paddle-shift sequential gearbox optional. The performance meter should be pegged: Saleen estimates 0-60 mph in 3.2 seconds, the quarter mile in 10.9 sec. and a top speed over 200 mph. The Raptor's aluminum chassis and composite body panels happen to be very similar in size to Ferrari's F430. And although the new Saleen rides on a 106.3-in. wheelbase that's identical to the S7's, the Raptor is 13 in. shorter and 5 in. taller, the last dimension no doubt an attempt to make the new car more people-friendly. Suspension is composed of double wishbones front and rear. The front brakes have 15.0-in. rotors with 6-piston calipers, while the rears are 13.0 in. with 2-piston calipers. Lots of rubber will keep this new Saleen glued to the road: 275/35R-20s up front and 315/35R-20s at the rear. The S5S Raptor being a more road- and people-friendly car than the S7 Saleen expects to sell it for $185,000. Toyota Motor Corp resently said on its battery joint venture with Matsushita Electric Industrial Co will start full-scale production of lithium-ion batteries in 2010 as it aims to roll out more electricity-driven cars over the next few years. Toyota, the world's top maker of gasoline-electric hybrids, is keen to bring such vehicles into the mainstream by lowering their cost premium as more consumers around the world demand higher fuel economy amid record-high energy prices. The battery venture, called Panasonic EV Energy Co, currently produces nickel-metal hydride batteries used in Toyota's hybrid vehicles, and is building two new factories to bring annual output capacity to 1 million batteries around 2010. Toyota, which put the world's first hybrid car on the road in 1997, has a goal of reaching global annual sales of 1 million hybrid vehicles soon after 2010, more than double what it sold last year. It has sold a total 1.5 million hybrids since the first Prius hybrid was launched over a decade ago. Many big automakers are working in partnership with battery makers on developing vehicle-use lithium-ion batteries.